This came out on Friday. Activists failed to prove that a Harris County redistricting plan illegally diluted Latino votes in the only Latino-opportunity commissioner precinct, a federal judge has ruled. In a long-anticipated decision filed late Thursday, U.S. District Judge Vanessa Gilmore said the plaintiffs, led by Houston City Councilmen James Rodriguez and Ed Gonzalez, were unable to demonstrate that a map adopted two years ago by the Harris County Commissioners Court was unconstitutional or that race was the predominant factor in the design of the plan. “There is no convincing evidence indicating that the Commissioners Court drew the district lines for the purpose of diluting plaintiffs’ voting strength,” Gilmore wrote in her ruling. The plaintiffs, however, did raise valid concerns that impediments to equal opportunity to participate in the political process do exist, the judge said. 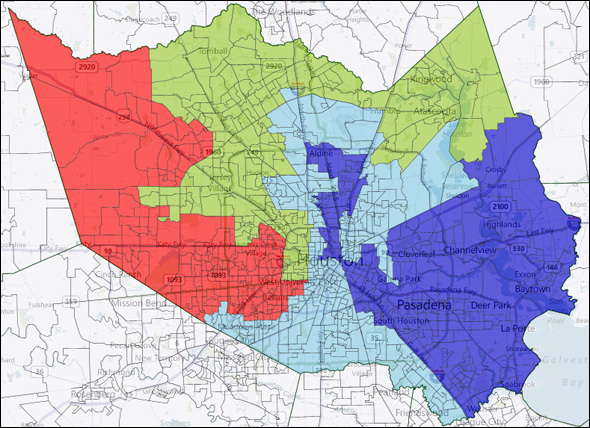 The lawsuit, which went to trial in November, was filed in 2011 as the Commissioners Court prepared to adopt a map with precinct boundaries based on the 2010 census. As part of that process, the county added a bloc of reliably conservative voters in the northeast portion of the county in Precinct 2 and slightly reduced the concentration of Hispanic voters. See here for the last update. The original map that was drawn in 2011 will now go into effect. There was an interim map used in 2012 that was a bit different than the original map, but since Precinct 2 Commissioner Jack Morman was not on the ballot it was no big deal. The interim map was slightly friendlier to Democrats in Precinct 2, and the 2012 election results showed that Precinct 2 would be very competitive in a high-turnout year. The Commissioners’ map was intended in part to shore up Morman’s re-election chances, and right now no one knows what the turnout model will be in 2014. No one knew about Battleground Texas or the #StandWithWendy phenomenon back when all this was being litigated. Point being, Precinct 2 should still be the marquee race around here next year. Commissioner Morman has the advantages he was given, and we’ll see how it shakes out from there. I have a copy of Judge Gilmore’s ruling here. It’s long, technical, and detailed, and I mostly zipped through it. I want to quote from the conclusion, however, since it captures the main points and suggests that however things are now, they won’t be that way forever. In conclusion, the Court finds that Plaintiffs have not established that the County’s Plan was unconstitutional. Plaintiffs did not prove that the County adopted the Plan intending to discriminate against Latinos nor did they prove that race was the predominant factor in the design of the Plan. Moreover, because Plaintiffs have not established the first Gingles factor, they cannot prove that, under the totality of the circumstances, Latinos have been denied an equal opportunity to participate in the political process and to elect candidates of their choice. See Growe, 507 U.S. at 40-41; Fairley, 584 F.3d at 667; Valdespino, 168 F.3d at 852. Nevertheless, Plaintiffs “have raised serious and valid concerns that hindrances to equal opportunity to participate in the political process are present.” Perez, 958 F. Supp. at 1230. Indeed this Court is troubled by evidence of the range and prevalence of voter suppression tactics employed against members of the Latino community. While some members of the Supreme Court imagine that barriers to voting have been eradicated, see Northwest Austin Municipal Util. Dist. No. 1 v. Holder, 557 U. S. 193, 204 (2009) (noting that “things have changed in the South”), the record here is replete with evidence to the contrary. While, to be sure, the County has taken some strides toward voter equality, it is clear that more can be done to ensure that all citizens have a full and fair opportunity to participate in the political process. It’s possible they will have changed enough by 2014 to be a difference maker, but that won’t happen without a lot of effort. Nonetheless, I think the odds of Commissioner Morman serving as long on the Court as some of his colleagues are slim. Morman, who faces re-election in 2014, was pleased with the outcome and said his precinct remains competitive. “It’s the only competitive precinct of the four, so whether it’s me or whoever is a county commissioner for Precinct 2, (we are) going to have to continue to do a good job to be elected,” he said. And hope that a partisan wave doesn’t wipe you out anyway. I look forward to seeing what happens next year. Texas Redistricting has more.